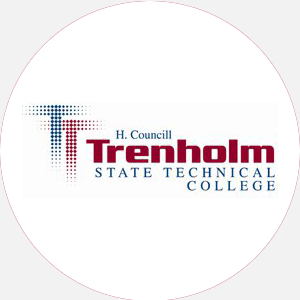 Trenholm State Technical College is a two-year, state-supported, coed, technical college founded in …. Trenholm State Technical College is a two-year, state-supported, coed, technical college founded in 1965. Trenholm State’s mission is to provide education that prepares students for meaningful employment, leadership, and citizenship. Trenholm State Technical College is accredited by the Southern Association of Colleges and Schools to award the Associate of Science and Associate of Applied Science degrees. Graduation from an accredited high school (or equivalent) with a minimum C average; official high school transcript; interviews for Dental Assistant and Practical Nursing programs. No application fee required. A minimum of 60 credit hours and completion of the core requirements to include 3 hours of mathematics and one computer course for accounting, stenography, and industrial electricity majors. Total enrollment: 667 Full-time undergraduates: 426 Part-time undergraduates: 241 Ethnic/racial makeup: African American, 522; Asian, 5; Caucasian, 133; Other/Unclassified, 7. Number of faculty members: 61 Student-teacher ratio: 16:1 Full-time faculty members: 47 Part-time faculty members: 14 Faculty with doctorates or other terminal degrees: 30%. Athletic Program Intramural Sports: basketball and softball. August-May (semesters) Commencement and conferring of degrees: May. Associate of Applied Science: Accounting, Automotive Body Repair, Culinary Arts, Dental Assistant Studies, Dental Lab Technology, Early Care and Education, Emergency Medical/Paramedic Studies, Executive Secretary Studies, Health Information Technology, Horticulture, Information/Word Processing, Legal Secretary Studies, Medical Assistance, Medical Secretary Studies Associate in Child Development: Early Care and Education Certificate: Automotive Body Repair, Culinary Arts, Dental Assistant Studies, Early Care and Education, Emergency Medical/Paramedic Studies, Executive Secretary Studies, Health Information Technology, Horticulture, Information/Word Processing, Legal Secretary Studies, Medical Assistance, Medical Secretary Studies, Nursing Assistant/Home Health Aide Studies, Radio and Television Broadcasting Diploma: Practical Nursing.